Introduction: Incisional lumbar hernia is an uncommon hernia type associated with lumbar incisions for nefrectomy, aortic aneurysm repair, bone resection on the iliac crest, or latissimus dorsi myocutaneous flaps. Open surgical procedures have significant postoperative morbidity and patient dissatisfaction. 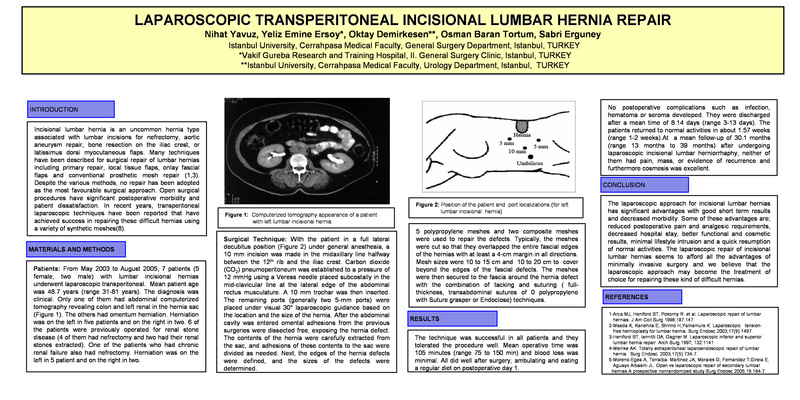 Patients and Methods: From May 2003 to August 2005, 7 patients (5 female, 2 male) with lumbar incisional hernias underwent laparoscopic transperitoneal intraperitoneal repair. Mean patient age was 48.7 years (range 31-81 years). 6 of the patients were previously operated for renal stone disease (nefrectomy, n:4 and renal stone extraction, n:2). One of the patients with chronic renal failure had nefrectomy. Abdominal computerized tomography of a patient revealed colon and left renal in the hernia sac. The others had omental herniation. With the patient in a full lateral decubitus position under general anesthesia, pneumoperitoneum was established. According to the case 3or 4 trocars (5 and 10 mm) (one for umbilicus) were inserted. To cover the hernia defect after exposure, polypropylene and composite meshes were used in five and two patients, respectively. Then prolene sutures and hernia staples were placed to secure the mesh intraperitoneally. Results: The technique was successful in all patients and they tolerated the procedure well. All did well after surgery, ambulating and eating a regular diet on postoperative day 1. No postoperative complications such as infection, hematoma or seroma developed. They were discharged after a mean time of 8.14 days (range 3-13 days). The patients returned to normal activities in about 1.57 weeks (range 1-2 weeks). At a mean follow-up of 30.1 months (range 13 months to 39 months) neither of them had pain, mass, or evidence of recurrence and furthermore cosmesis was excellent. Conclusion: The laparoscopic approach for incisional lumbar hernias has significant advantages with good short term results and decreased morbidity. Some of these advantages are; reduced postoperative pain and analgesic requirements, decreased hospital stay, better functional and cosmetic results, minimal lifestyle intrusion and a quick resumption of normal activities. The laparoscopic repair of incisional lumbar hernias seems to afford all the advantages of minimally invasive surgery and we believe that the laparoscopic approach may become the treatment of choice for repairing these kind of difficult hernias.